Fair. 0134749758 **PLEASE NOTE** This book has suffered some water marks that may cause staining or wavy pages, however it is a good, usable copy. Regardless of title, CD/DVD/Access Codes or Supplemental Materials are not guaranteed. This is a U.S. Student Edition Book. This book is not a rental. Very Good. 0134749758 PLEASE READ >> CLEAN softcover marked ANNOTATED INSTRUCTOR'S EDITION. Some cover wear/creasing. Same content as student text except with teaching notes. 15th Edition. DAILY SHIPPING! Very Good. 0134749758 ****WARNING**** ANNOTATED INSTRUCTORS COPY. 15TH EDITION. IDENTICAL STUENT CONTENT. TEXTBOOK ONLY! ! ! ! SHIPS SAME OR NEXT BUSINESS DAY WITH DELIVERY CONFIRMATION! ! Good. The cover is creased on this item. The text of this book has NO notes or markings. Used-Like New. Annotated Instructors Edition, Used Like New, no missing pages, no damage to binding, may have a remainder mark. Good. Awesome Text For the Price! ! ! Good. Ship within 24hrs. Satisfaction 100% guaranteed. APO/FPO addresses supported. Trade paperback (US). Glued binding. 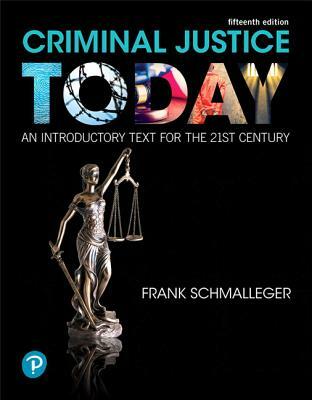 736 p. What's New in Criminal Justice. The book is in a very nice condition and arrived before the stated time. It is older and I'm certain some of the laws in it have changed but I am enjoying reading and learning from it. It's a big book and the reading is going slowly but I'll get it finished one day.